A team of scientists who analyzed the brain tissue of renowned NFL linebacker Junior Seau after his suicide last year have concluded the football player suffered a debilitating brain disease likely caused by two decades worth of hits to the head, researchers and his family exclusively told ABC News and ESPN. In May, Seau, 43 -- football's monster in the middle, a perennial all-star and defensive icon in the 1990s whose passionate hits made him a dominant figure in the NFL -- shot himself in the chest at his home in Oceanside, Calif., leaving behind four children and many unanswered questions. Seau's family donated his brain to neuroscientists at the National Institutes for Health who are conducting ongoing research on traumatic brain injury and football players. 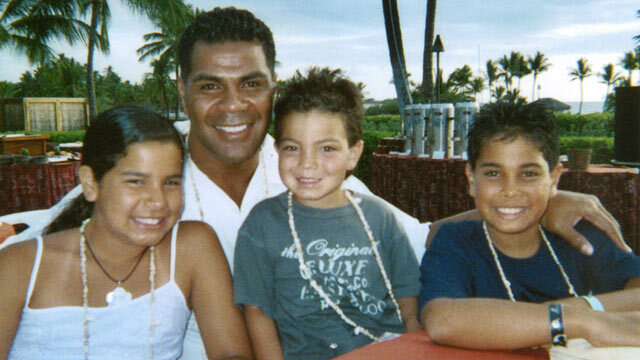 Seau's family described to ABC News and ESPN a long descent into depression in the years prior to his death. Gina Seau, his ex-wife with whom he remained close following their divorce, said the linebacker had difficulty sleeping and became withdrawn and "detached emotionally" from his children. In one exchange, he described his mood as "low" and "dark." "A lot of things, towards the end of his life, patterns that we saw and things that worried us, it makes sense now," she said of the diagnosis. The night before his death, Seau sent a text message to his ex-wife and children in which he simply wrote, "I love you." They were the last words anyone would hear from him. More than 30 NFL players have in recent years been diagnosed with CTE, a condition once known as "punch drunk" because it affected boxers who had taken multiple blows to the head. Last year, some 4,000 retired players filed lawsuits against the league over its alleged failure to protect players from brain injuries. The NFL has said it did not intentionally hide the dangers of concussions from players and is doing everything it can now to protect them. Gina Seau said she and her ex-husband expected physical injuries from playing professional football but never thought "you're putting your brain and your mental health at a greater risk." Junior Seau, she said, was never formally diagnosed with a concussion but routinely complained of symptoms associated with concussions after receiving hits to the head during games and in practices in 20 seasons in the NFL. "The head-to-head contact, the collisions are just, they're out of control," Gina Seau said. "He was a warrior and he loved the game," she added. "But ... I know that he didn't love the end of his life." For the Seaus, football gave them everything and, they believe, has now taken it all away. They understand its attraction and, all too well, its routine danger. None of the Seau children play football anymore and their mother is glad of that. "It's not worth it for me to not have a dad," said one of the Seaus' sons, Tyler Seau, 23. "So, to me, it's not worth it." "We appreciate the Seau family's cooperation with the National Institutes of Health. The finding underscores the recognized need for additional research to accelerate a fuller understanding of CTE. The NFL, both directly and in partnership with the NIH, Centers for Disease Control and other leading organizations, is committed to supporting a wide range of independent medical and scientific research that will both address CTE and promote the long-term health and safety of athletes at all levels. The NFL clubs have already committed a $30 million research grant to the NIH, and we look forward to making decisions soon with the NFL Players Association on the investment of $100 million for medical research that is committed in the Collective Bargaining Agreement. We have work to do, and we're doing it." Editor's Note: An earlier version of this story identified the more than 4,000 lawsuits against the NFL as a "class action." The suits are not a singular class action case, but multiple complaints filed in numerous districts.